Our Halloween this year was one I will never forget. It was a full day since we had Aiden's first birthday party earlier that afternoon, but Aiden did awesome! He is such a laid back little guy and was such a trooper keeping his costume on (glasses and all) and pushing through even though he was probably exhausted not to mention he was also cutting his first tooth! I knew early on what I wanted Aiden to be for Halloween. It only made sense that he be Harry Potter since I read all the books while I was pregnant with him. I can honestly say he is the most adorable baby Harry Potter I have ever seen. I didn't want to stop taking pictures of his cute face. Being that it was Aiden's first time Trick or Treating, some of his Aunts and Uncles came over to hang out. A few of them even got into character themselves! My Mom, Grandma and Aunt even swung by the neighborhood and drove alongside us. I think Aiden might be loved...a little bit. Our neighbors absolutely loved seeing Aiden in costume and he made out pretty well with his candy stash. I was surprised to see him actually grab candy out of the candy bowls that were offered to him. He became so attached to an unopened Milky Way candy bar that he had to push his walker one handed up a hill. He apparently has his Mama's love for chocolate. It was a magical night and we had so much fun taking our boy Trick or Treating for the very 1st time. Do you still dress up for Halloween? I plan to milk family costumes for as long as possible! Seriously, those glasses. Killing me! What a FUN day for you all. So creative and adorable. This is seriously the cutest family costume/baby costume EVER! You guys NAILED it. The cart with the owl was seriously the best! This is adorable!!!! I can't get enough of these pictures of him dressed up!!! Y'all did a great job with this theme!!! Love it!!!! Definitely the cutest lil HP I ever did see! :) So glad you guys had so much on Aiden's first bday!! I love your family costumes!! And Aiden really did make an adorable Harry Potter! So, so adorable!! He is the cutest little Harry Potter - baby or otherwise. I love the idea of family costumes. 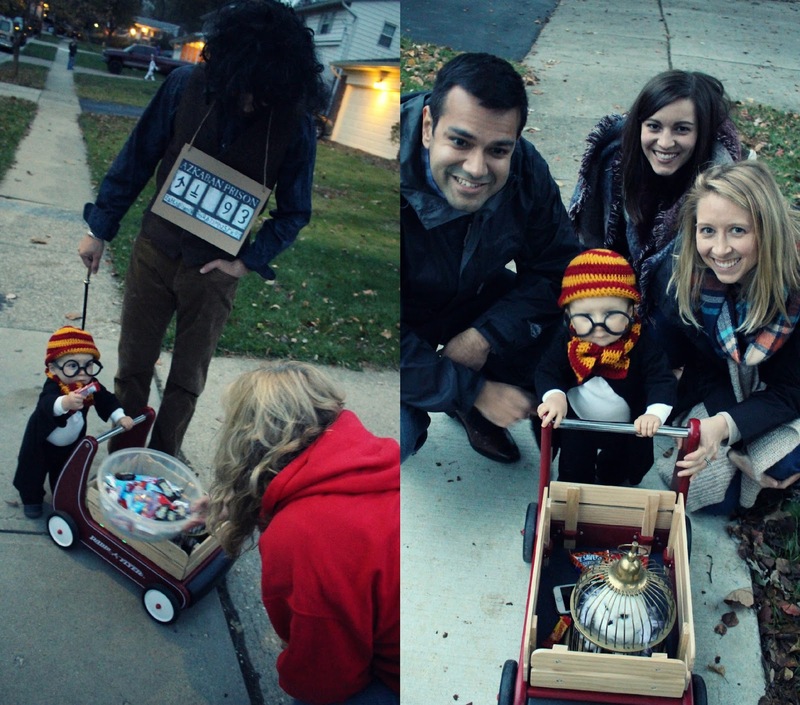 your whole family wins the award for most heart-warming costume. gah, everytime you posted a harry potter pic i just wanted to run over and hang out with y'all. so so cute. oh. my. goodness. he literally is the cutest mini harry potter i've ever seen. made me smile. and i love that your husband was Sirius Black. Hilarious. Great job, y'all!